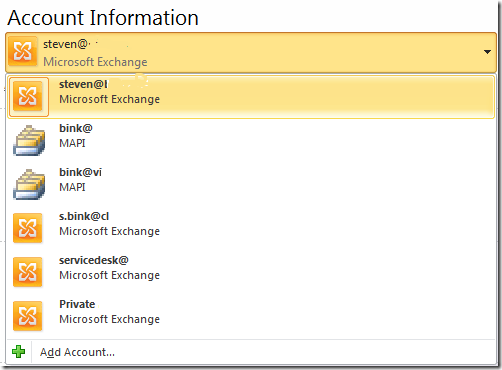 Outlook 2010 supports 15 Exchange Server e-mail accounts. 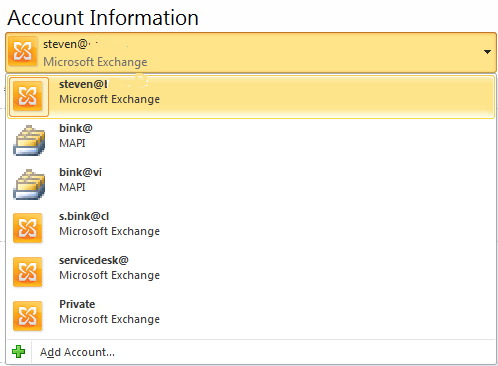 Steven Bink over at Bink.nu has found a rather cool feature in the Beta of Outlook 2010, adding multiple Exchange Server accounts from different organisations. Below is a screenshot of his Outlook accounts. When you compose a new e-mai you can specify which Exchange mailbox you can use in the same way as with POP3 and IMAP mailboxes. “Before Outlook 2010 you could add extra mailboxes, but only from the same organization and sent items were saved in sent items folder of the main mailbox. Now in Outlook 2010 by default it will let you connect to 3 Exchange mailboxes maximum, in or outside default Exchange organization. I personally won’t use this but it’s a rather handy feature for some users with multiple Exchange Mailboxes. This entry was posted in Office on 8 December 2009 by Steven.